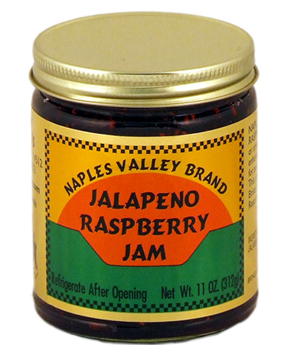 No pantry is complete without a jar of Naples Valley Jalapeno Raspberry Jam. Serve with crackers over a brick of cream cheese for an instant hors d'oeuvre that tastes amazing. This jam is also great as a glaze for pork and poultry. It even tastes great over veggies, and can enhance the flavor of stir fry dishes too. Your friends and relatives will think you are a professional chef when you use this jam to improve the taste of your favorite foods. Naples Valley Brand Jam is a rich, high quality jam with no artificial ingredients or preservatives. It is the perfect addition to any dinner party or gathering, but is also great to have on hand for everyday use. This great jam is made by hand daily using only fresh, all natural ingredients. You will find that it tastes amazing, and is intensely flavorful. This is the perfect gift for all those jalapeno lovers out there, but makes a great addition to any fridge. You are viewing the Jalapeno Raspberry variety, but we also carry the Red Pepper version too. Click here for details. Choose a healthier jam with outstanding flavor. 11 oz. Uses enhance stir fry, glaze pork, as a dip, etc. Ingredients sugar, raspberries, vinegar, jalapeno peppers, water, pectin. Naples Valley Jalapeno Raspberry Jam - Hand crafted for an irresistible gourmet taste. This all natural gourmet jam will greatly enhance all kinds of food. The perfect gift for all those jalapeno lovers out there.